It's no secret that everyday stresses are reflected not only on our minds but also bodies. Skin and internal organs remember minute stress like spilled coffee even if we forget about it pretty quickly. To relieve the tension and boost the body's natural functions, it's best to trust professional masseurs and cosmetologists at a spa. Sharel spa center is located in the Halytskyi district not far from the Pototski Palace. The cozy interior, calm music and flickering candles create a welcoming atmosphere in Sharel. The spa offers a wide range of service from various kinds of massages and wraps to full-on fitness and slimming programs. The staff uses holistic methodic paired with cutting-edge equipment for the long-lasting effect. For instance, a spa treatment is done with thermal water, healing muds, seaweed, oils and extracts of healing plants. The range of services comprises popular treatments like stone therapy, body and facial sculpturing massages, cryomassage, and thalassotherapy - using sea water in skin treatment. Besides, Sharel offers treatment sets: to give an idea, 'Full Relaxation' set includes hydromassage (10-minute jacuzzi, aromatherapy, ozonotherapy, underwater manual massage), body scrub, and Head Spa with Takara Belmont Micro Mist. The price for the set is UAH 2500. Prices for massage start at UAH 250 and depend on the body part: for instance, face massage will cost UAH 250, while the whole body massage is UAH 650. Stone therapy costs UAH 850-1000 depending on the duration of the session. Premium Relax Club offers the wide array of health and beauty treatments. Visitors of the cozy spa can choose among traditional Thai massage, stone therapy, body wraps and the special massages aimed for the full body relaxation. For instance, ancient Slavic massage, Hawaiian lomilomi or Taoist belly massage represent the authentic treatments. Like in many popular spas and massage centers in Lviv, an anti-cellulite program is available at Premium Relax Club. 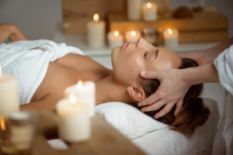 Skin treatments from facial masks to scrubs is popular here as well: the spa uses high-quality French and Italian cosmetics to make sure the result is lasting. Moreover, Premium Relax Club has specialists that will help with hair removal, makeup, hairdressing and manicure. The prices for Thai massage are pretty average for Lviv salons, starting at UAH 390 for head and neck massage and UAH 590 for traditional whole body Thai treatment. As for the skin treatments, the prices for spa-wraps starts at UAH 620 depending on the duration of the session and materials used. Taurus Hotel & Spa is located in a quiet district right in the heart of Lviv, steps away from the National Opera and Ballet Theatre. 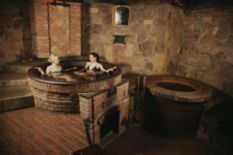 The hotel comprises elements of the spa and traditional saunas and is often mentioned as one of the best places to relax in Lviv. Thus, spa treatments at the Lviv's facility include various types of massages like regenerating, relaxing, massage with aroma oils, and honey. Anti-cellulite treatment in a form of massage is available here as well. Taurus has two classic types of sauna, Roman and Finnish, to fully enjoy the relaxation of body and soul. Jacuzzi is available for those who want to enjoy bubbles. The pool at Taurus is equipped with the counter flow and artificial waterfall, which is often used for massaging shoulders. The hotel has a special "Wellness" package for those who want to enjoy the full program of revitalization — moreover, it includes a complimentary pearl bath or a vortex bath up to the guest's choice. The full price list is available on the official website of the hotel. To give an idea, hydrotherapy starts at UAH 250 per session, and various types of massages like Creole, honey or classic range from UAH 300 to UAH 700. Complex treatments usually last 2.5 hours. The price starts at UAH 1000 depending on the components. Wai Tai Spa chain is represented in Lviv by two salons conveniently located in the city center. The spa offers the traditional Thai massage for relieving stress and tension: a number of gentle techniques are carried out on the floor using the feet, knees, elbows, palms, forearms and thumbs. Treatments at Wai Tai includes full body routines as well as localized therapy like facial treatment or feet massage. Visitors may also choose from aromatherapy, stone therapy and the traditional Thai herbal compress massage. Treatment programs for kids are available as well. The price for traditional Thai massage depends on the session duration: an hour during daytime will costs UAH 1000, 90 minutes cost UAH 1400 and 120 minutes cost UAH 1700. The price goes up in the evenings. As for the face massage, 20 minutes of treatment will cost UAH 500 during daytime and UAH 600 in the evening. Legenda SPA is located in the out-of-center Shevchenkivskyi district reachable from the center by trams and buses. The spa center boasts a 20-meter pool with geysers, fountains and massaging elements. Visitors often come here for aqua aerobics classes available for adults and kids. Apart from the pool, Legenda offers to relax in the Roman and Finnish sauna or enjoy the infrared sauna treatment. The list of massages available at Legenda includes but isn't limited to lymphatic drainage, connective tissue massage, therapeutic massage of the whole body and massages for kids. A bar with healthy snacks and cocktails welcomes visitors after the treatments. The access to the pool costs UAH 80. Finnish sauna at Legenda Spa costs UAH 300 per hour. On Fridays, Saturdays and Sundays, visitors can use a special offer: three types of sauna and access to the pool for UAH 350 per 3 hours.